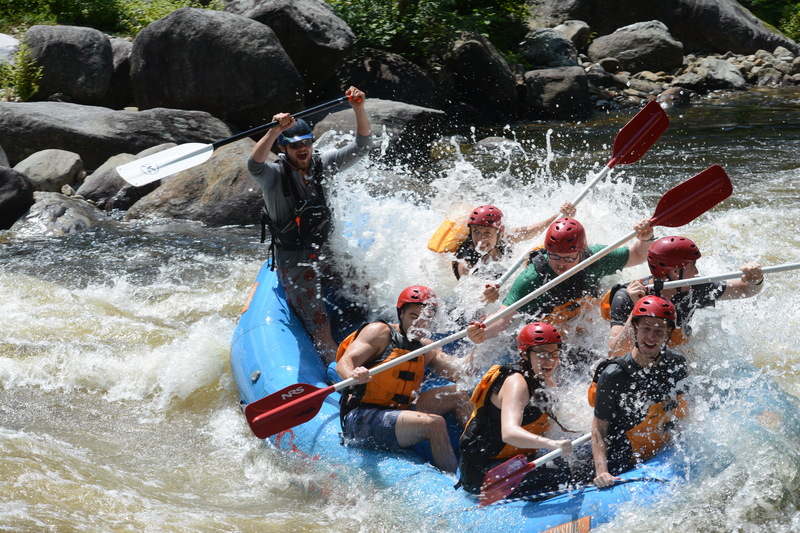 A “dump truck” in rafting occurs when all of the passengers in a raft are “dumped” out during a rapid. There are a few points to consider in determining what constitutes an actual “dump truck”, the main factor being whether all of the paddlers fall out of the raft. If even one paddler stays in the raft, then it is not considered a “dump truck”. Another key question is whether the raft guide falls out of the raft as well as the guests. Some rafters consider it to be a true “dump truck” only if the guide stays in the raft, much like the driver of a dump truck who empties his cargo, but obviously remains in the truck while doing so. Others consider it a “dump truck” only when the guide also falls out along with his guests, leaving the raft completely empty. Check out this series of photos of a “dump truck” where the guide falls out with their guests http://www.youtube.com/watch?v=zBFK-LD4_fU and another where the guide dumps out his entire crew, but stays in the raft http://www.youtube.com/watch?v=BwqdUHPeJw8. This final video claims to be a “dump truck” in the title, but is not because all paddlers do not leave the raft http://www.youtube.com/watch?v=vZfssXKOn6o.